CALIFORNIA – With water woes plaguing many Caribbean countries, the thought of a home appliance that pulls all the water a household needs out of thin air using only solar power sounds like the stuff of fantasy. That fantasy nevertheless became reality last week, with the demonstration of a water harvester that uses only ambient sunlight to pull litres of water out of the air each day in conditions as low as 20 percent humidity, a level common in arid areas. The solar-powered harvester, documented in the journal Science, was constructed at the Massachusetts Institute of Technology (MIT) using a special material – a metal-organic framework, or MOF – produced at the University of California, Berkeley. “This is a major breakthrough in the long-standing challenge of harvesting water from the air at low humidity,” said Omar Yaghi, one of two senior authors of the paper, who holds the James and Neeltje Tretter chair in chemistry at UC Berkeley and is a faculty scientist at Lawrence Berkeley National Laboratory. 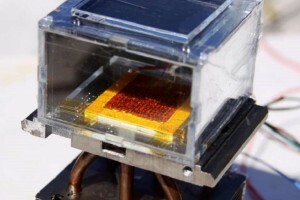 The prototype, under conditions of 20-30 percent humidity, was able to pull 2.8 litres of water from the air over a 12-hour period, using one kilogram of MOF. Rooftop tests at MIT confirmed that the device works in real-world conditions. “One vision for the future is to have water off-grid, where you have a device at home running on ambient solar for delivering water that satisfies the needs of a household,” said Yaghi, who is the founding director of the Berkeley Global Science Institute, a co-director of the Kavli Energy NanoSciences Institute and the California Research Alliance by BASF. According to Science Daily, Yaghi invented metal-organic frameworks more than 20 years ago, combining metals like magnesium or aluminium with organic molecules to create rigid, porous structures ideal for storing gases and liquids. In 2014, Yaghi and his UC Berkeley team synthesized a MOF – a combination of zirconium metal and adipic acid – that binds water vapour, and he suggested to Evelyn Wang, a mechanical engineer at MIT, that they join forces to turn the MOF into a water-collecting system. Wang and her students designed a system consisting of more than two pounds of dust-sized MOF crystals compressed between a solar absorber and a condenser plate, placed inside a chamber open to the air. As ambient air diffuses through the porous MOF, water molecules preferentially attach to the interior surfaces. X-ray diffraction studies have shown that the water vapour molecules often gather in groups of eight to form cubes. Sunlight entering through a window heats up the MOF and drives the bound water toward the condenser, which is at the temperature of the outside air. The vapour condenses as liquid water and drips into a collector. Yaghi nevertheless noted that there was still much room for improvement. The current MOF can absorb only 20 percent of its weight in water, but other MOF materials could possibly absorb 40 percent or more. The material can also be tweaked to be more effective at higher or lower humidity levels. “It’s not just that we made a passive device that sits there collecting water; we have now laid both the experimental and theoretical foundations so that we can screen other MOFs, thousands of which could be made, to find even better materials,” he said.